Catalog Page 49. Thrifty Family of stuffed animals. Custom alligator and blood drops. The Thrifty Family features inexpensive 6" and 8" personalized plush animals. This collection features stuffed blood drops, a brown bear, white colored bear, white dog, brown dog, tiger, lion, monkey, frog, alligator, moose and a cow. The pricing includes the printed t-shirt. 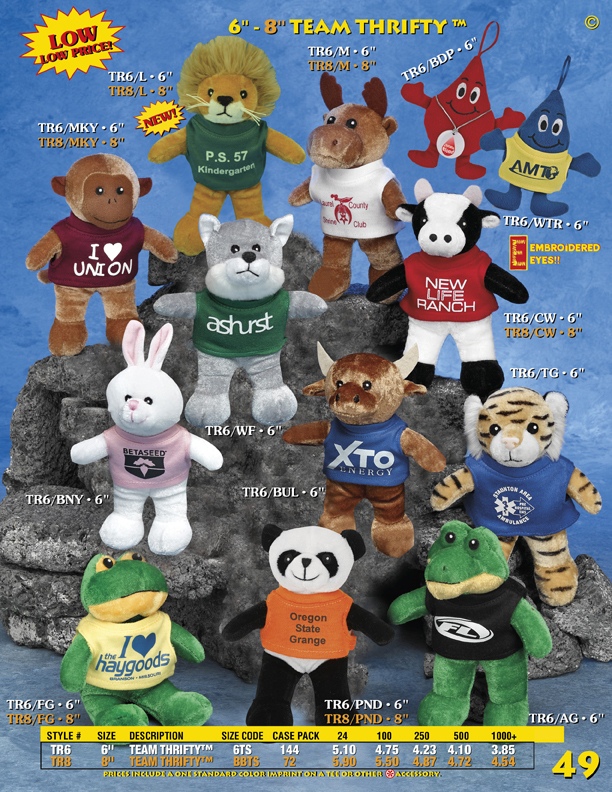 These low priced plush animals are a great option for giveaway promotions. These animals have embroidered eyes. Not all the animals are available in the 8" size. Look at the item number to determine the size available. In addition to bears with t-shirts, we also offer printed accessories including hats, bandanas, scarves and ribbons. If you prefer not to use a t-shirt and are willing to order 2,000+ pieces, we can custom manufacture an embroidered teddy bear or stuffed animal based upon your design. The rear pages of the catalog show many custom designs. We have over 40 years of experience manufacturing stuffed animals. Send us your design today for a free quote.